This accomplished Boomer artist has painted professionally most of her life, and she has no intention of stopping. 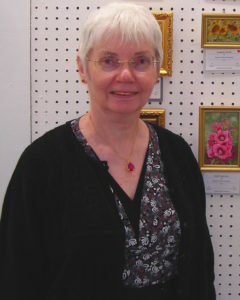 Beverly Abbott is a Signature Member of the Miniature Artists of America (since 2008), and the Society of Animal Artists (since 2009). Both are international organizations. She has won many awards for her paintings the world over. She’s in the Marquis’ Who’s Who in America 2000 – 2009, Who’s Who in American Women 2000 – 2010, and Who’s Who in the World 2001 – 2009. We caught up with her in between her travels, in her home in Newport News, Virginia. She paints predominantly at night. It’s Friday afternoon, and we begin our conversation. So when did you get into art? Oh, I’ve always enjoyed creating. Like all children I started with Crayons and coloring books. And I found ways to enhance my schoolbook reports with artwork! My grandmothers and mother taught me to embroider, crochet, and sew. They always encouraged me to do new things in art. My mother purchased paint-by-number kits. We painted them together. With the leftover paint, I created my first original oil painting at age twelve. How did you get into miniatures? In 1974, Chester Smith, founder of Seaside Art Gallery in Nags Head, N.C. began carrying my paintings. He often told me he never had an artist who could successfully paint in so many different styles, subjects, and media. One day, he gave me a group of tiny frames and asked me to paint something for them. The smallest opening was 1/2”x1/2”. I painted a white cat sitting on a blue pillow on a chair! When did you first enter competitions? In 2002, I met miniature artist Wes Siegrist at a show. He encouraged me to enter the miniature art competitions. I started with the Miniature Art Society of Florida. Since then my miniatures have been as far away as New Zealand and Russia. I regularly send my miniatures around the nation entering them in miniature competitions, and competitions of full sized paintings and sculpture. They’ve won many honors and awards including several in Best in Show. Tell us about the painting you did at dog shows. During the 1970’s and 80’s I showed my Miniature Shorthaired Dachshunds at American Kennel Club Dog Shows. My husband Ira, and I would set up a booth at the shows. I sold limited edition prints and tee shirts with my dog art printed on them. I also painted portraits of exhibitors’ dogs on tee shirts for the owners. The process fascinated children. Adults came by several times during the course of a day to watch my progress. I eventually painted portraits in oil at the shows. What would you tell anyone wanting to paint? It’s never too late to begin to draw or paint. They’re two different but related skills. In my opinion, accurate drawing is the more difficult and takes time and practice to master. Being an artist is a mindset… it’s a reflection of how you view the world. With a skilled, caring instructor you can learn to paint and bring a sense of wholeness, satisfaction, and peace to your life. Have you thought of slowing down? I immerse myself in painting for hours on end most days! I have a passion for painting miniatures and I’m always looking forward to the next painting. I find all phases of art enjoyable from gathering resource material on my trips, to sharing, demonstrating, and educating viewers about miniature art. Creating art is my profession, pleasure, and lifelong passion. Want to see more of Beverly Abbot’s artwork? You can see this award-winning artist’s paintings at Seaside Art Gallery. It’s one of the largest galleries in the Southeast with 55 years of excellence and reputed customer service. It’s owned and operated by Melanie Smith. 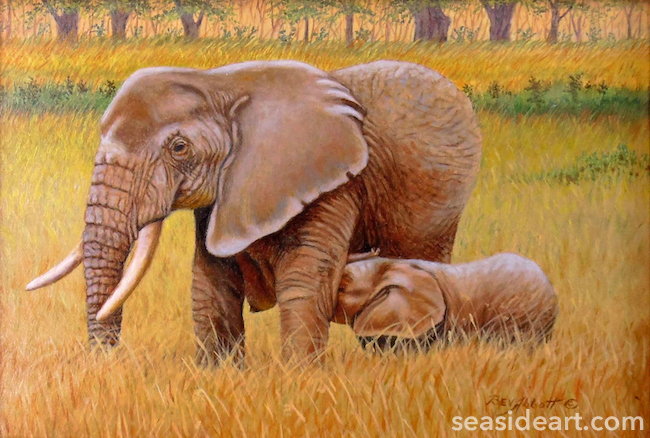 Seaside Art Gallery is at 2716 South Virginia Dare Trail in Nags Head N.C. Their toll-free number is 800-828-2444. The gallery has a generous policy of 30-day refund or 5-year exchange. They ship anywhere.